Dr. Sarawut Ninsawut, Professor Remote Sensing; GIS, Department of Information and Communications Technologies (ICT), School of Engineering and Technology (SET), Asian Institute of Technology (AIT), Thailand and his team together with The Royal Development Projects Board, and The Thai Land Development Department have now launched the International Vetiver Grass Tracking (IVGT) System to track vetiver application site data world wide. The user interactive site will allow free registration of users and others associated with the Vetiver System to locate new and existing sites, update them, and add quantitative data and imagery. Non registered public viewers will be able to view sites and see summarized global data associated with the sites. 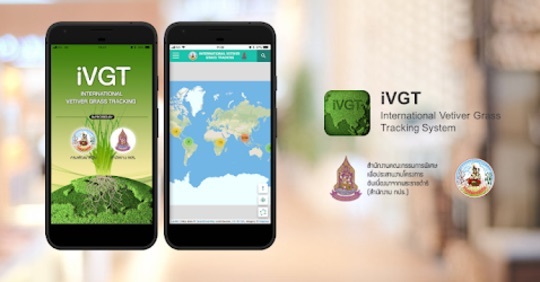 IVGT will be administered by Thai and TVNI "Administrators", will be moderated by "Surveyors" and will have a registered ground level membership of "Investigators" who may own their own vetiver sites or who can enter new sites on behalf of other vetiver users. The IVGT will be under the oversight of the Thai Land Development Department (LDD). It is intended that IVGT will follow the principles of Wikipedia - on trust and honest input, with minimum interference by "Surveyor" monitors. Fake vetiver sites will be delete by administrators. The many Vetiver System application sites will be searchable by application site and by country. (1) computer based at https://ivgt.ldd.go.th/vetivertrack/ (operational). (2) Android app from Playstore called IVGT - https://play.google.com/store/apps/details?id=com.ivgt.app (available). (3) iOS app currently under review by Apple. All three platforms have the same capability.